Raven activates magical powers and combines them with our Free Will. He is the guardian of magic used during practice distance healing. Directs the beneficial process of change in consciousness that will lead to the creation of a new reality and avert disease. According to Indian notions Raven participated in the creation of the world and he was endowed with supernatural strength and magical abilities; probably because it is considered the symbolic bird of the Yukon Territory of Canada.The Navajo Indian religion is worshiped as a guardian of wild game, and the myths of the Tlingit Indians as the founder of civilization. Raven magic is identified with: Transformation, Sexuality, Creation, divination, the Witch, A change of consciousness, the power of thought. Raven is the patron saint : Visionaries and seers. It also supports intelligent people who seek to broaden their knowledge. Raven as a totem : the adept bestows power and healing, changing his karma and illuminates the way he walks practitioner. Time of the year identified with Raven : Winter. Color identified with Raven : Black. Tree equated with Raven : Ebony. 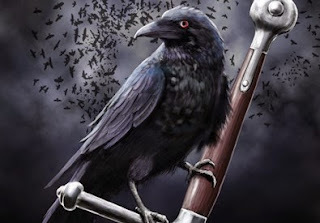 The above description briefly describes the elements that should be combined with Raven during a magical practices aimed at this extraordinary animal. Certainly in the case of Shamanism, Natural Magic and Wicca - Raven may prove to be a useful companion. These are just examples, because it is rich in symbolism of the raven.